The region of Bio Bio, often called by its ancient designation of "Octava Region" (Eighth region of Chile) has an area of 37,068,7 km² and a population of just over 2,100,000 people. 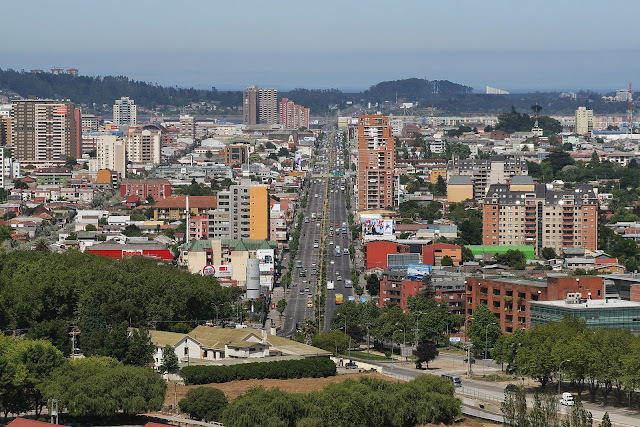 Its capital is the city of Concepcion, the largest of Southern Chile and second largest in the country. The population of Greater Concepcion, including Talcahuano and other adjacent communes reaches nearly a million inhabitants. It is an industrial city, especially as it relates to forestry and derivatives, agribusiness, iron and steel production, oil refinery, coal mining in the commune of Lota, fishery, although lately quite run-down. The educational area also has a good level of development because here are concentrated many Professional Institutes and Universities either private or state-backed, of great importance nationwide. Besides, this region, located on average about 500 km. South of Santiago, is also prolific in natural beauty. The arrival may be through the numerous bus lines or by air to the Carriel Sur Airport of Concepcion. Here is a list of places to visit in Bio Bio, which will be gradually complemented with further information. Important Update: In September 2018 was created the new Ñuble Region, which until then was part of Bio Bio. Its population is 480,000 inhabitants and the capital is the city of Chillan. 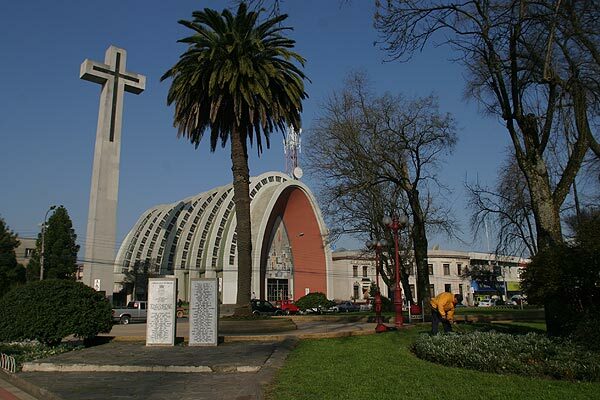 Just in front of the Plaza de la Independencia, built between 1940 and 1950, officially handed over in 1964, it replaced the original building destroyed by a major earthquake in 1939, known as the "Chillan earthquake", which left 30,000 dead. Inside the Temple is located the Museo de Arte Sagrado (Sacred Art Museum), an artistic and historical collection. 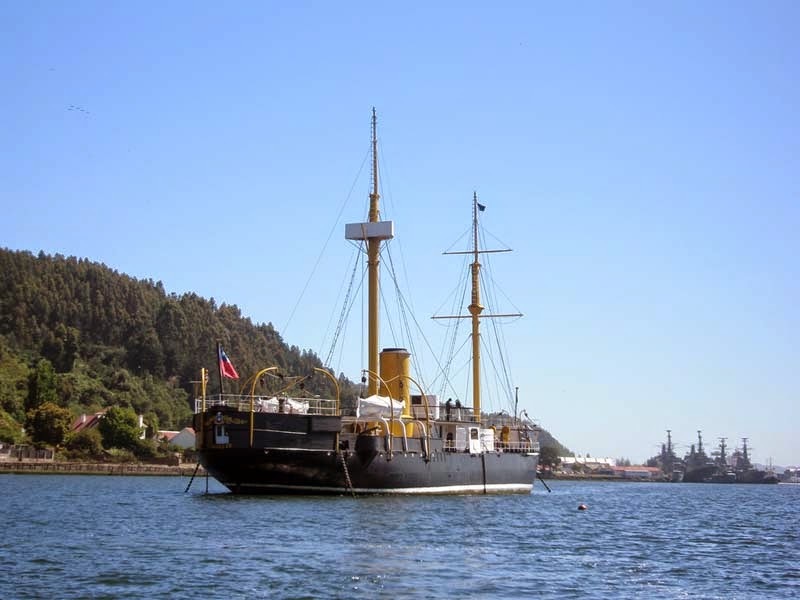 Historical battleship of the nineteenth century, currently restored and converted into a floating museum anchored in the port of Talcahuano, Chile's main Naval Base. More than once this true relic has caused controversy between Chile and Peru. Built by British shipyards in 1863, the Monitor Huascar was the flagship of the Peruvian Navy during the War of the Pacific. After the Naval Battle of Iquique, where the Huascar faced and sank the Chilean corvette Esmeralda, it was captured by Chile in the Battle of Angamos, October 8, 1879. In this combat died the Peruvian Admiral Miguel Grau, the greatest Peruvian naval hero. The Huascar, is one of the oldest floating museums of the world and more than a trophy of war, it is a symbol of brotherhood, it has been defined by the Chilean Navy as a "floating shrine of the naval glories of Chile and Peru". After suffering the ravages of the tsunami that struck Chile on February 27, 2010 which moved the ship about 30 meters from its original position, the monitor Huáscar was soon returned to its place of anchorage in the port of Talcahuano, one of the most affected by waves. In 1995, the World Ship Trust awarded the Chilean Navy with the "Maritime Heritage Award" for the excellent restoration of the "Huascar" and the invaluable historical testimony that this work represents for Chile and Peru. Visiting Hours: Tuesday to Sunday from 9:30 to 12:30 hrs. and from 13:30 to 19:30 hrs. Located 35 km. from the coast facing the border of the Regions of Biobio and La Araucania. Discovered in 1550, it has 14 km. long and an average of 6 km. wide, its central part covered by a lush forest. The island was a refuge for English and Dutch corsairs such as Sir Francis Drake, Olivier van Noort and Joris van Spilbergen. Many ships sank around its shores in ancient times, some of them laden with treasures. Its main attraction is Reserva Nacional Isla Mocha, managed by CONAF (National Forest Corporation). The main tourist activities are guided trekking circuits with varying degrees of difficulty; horseback riding, horse cart rides, mountain biking, diving, exploring the shipwrecks around the island, birdwatching, observation of the abundant sea life, especially the spectacular sea lions colonies. You can also practice water sports like windsurfing and sport fishing. Mountain Resort and Thermal Spa, important tourist center located in the Andean foothills of Chile's Eighth Region, 82 km. from Chillan and 194 km. from Concepcion, open all year round. 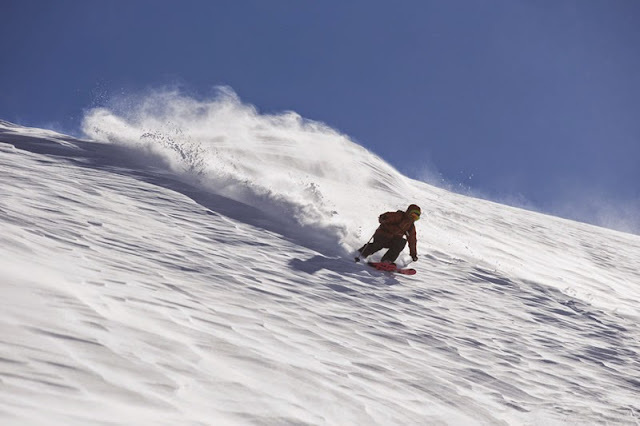 There are fun daily activities for all ages and relaxation in Summer and especially Winter, when its ski slopes, considered among the best in South America are in operation. This mountain resort, projected to become one of the largest in South America in the short term, currently consists of 2 Hotels: Hotel Nevados and Hotel Alto Nevados, this latter in the middle of the Nevados de Chillan Ski Center. There are two Winter Sports Centers, Nevados and Valle Hermoso, 11 ski lifts, 6 cafeterias, 3 spas, a large Bike Park and 8 pools with thermal waters in different places. One of the great tourist attractions of the region of Biobio. Situated between the Chilean cities of Los Angeles and Chillan, taking a small detour on Ruta 5 Sur (Panamerican Highway), 479 km. south of the capital Santiago. 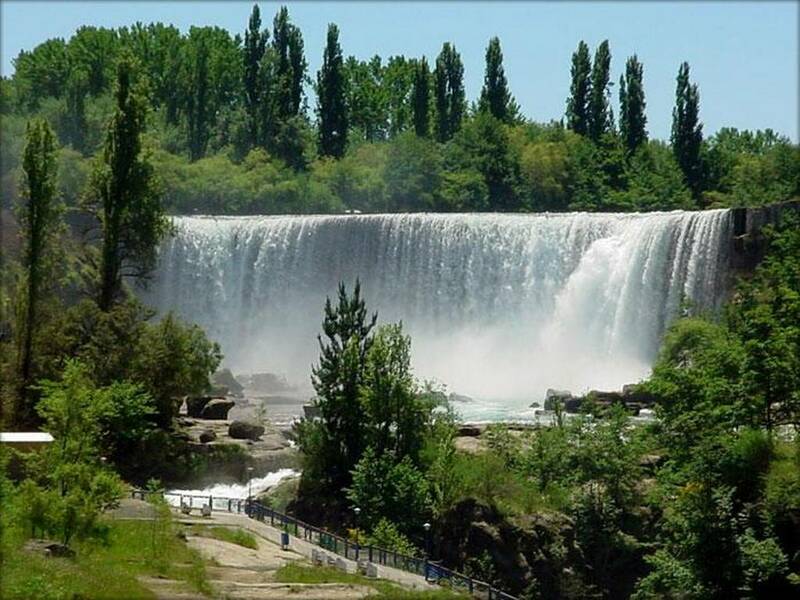 The waterfalls are made up of four magnificent cascades, between 40 and 55 mts. in height. Although not with the same volume of water as before due to the current climate change, this is a must stop when one makes a trip to this part of southern Chile. There is a wide range of tourist services in the surroundings to cater to visitors. Small town of just over 3,000 inhabitants located in the commune of Tomé, 37 km. N. of Concepcion, whose infrastructure was badly damaged by the tsunami of February 27, 2010. Today it has resumed its normal life and the authorities have placed special emphasis on recovering the tourist flow the town always had. Its bay has the shape of a huge semicircle, of white sand and calm waters. During the Summer there is a wide range of entertainments including a major Music Festival, besides the gentle surf of its sheltered bay allows a safe practice of all kinds of water sports. The offer of Hotels and services is wide and available year round. In the commune of Tomé there are also several other beaches of great natural beauty such as Playa Bellavista, (2 km. away from the main square), Playa El Morro, (the closest to the town), Pingueral, in an exclusive seaside residential area, with a varied tourist offer, situated 2 km. from Dichato, Playa Pudá, beautiful beach about 6 km. from Dichato, of great extent, this place is known for its strong waves, yellow sand and clear waters, not suitable for swimming but ideal for recreational shore fishing, photography and relaxing walks; Playa Punta de Parra, located 7 km. S. of the city of Tomé, a small paradise to relax, provided with a beautiful natural setting, has an area where the trees grow naturally, a restaurant, picnic area and hiking trails in the forest. It is a 75 mts. lovely natural cascade belonging to the Itata River, hitherto little known but whose landscape keeps the typical beauty of the countryside of southern Chile. It is located 18 km. from the town of Yungay, Province of Ñuble, Region of Bio Bio. The place is open all year round and is suitable for hiking, swimming, photography. You can appreciate its abundant vegetation with native trees, shrubs and wild flowers surrounding the place. Following the course of the river Itata you will also see the Saltillo del Itata, a cascade of much lower height but in an equally charming location, where a natural pond is formed, with abundance of native vegetation, picnic area, camping and good fishing. Laguna del Laja National Park, of 11,600 hectares, is located in the Andean foothills of the Biobio Region, Commune of Antuco, 93 Km. from the city of Los Angeles and very close to the border with Argentina. The nature of southern Chile is wonderful and this park is no exception, inside there are several pathways you can walk to enjoy the landscape. The main activities are sport fishing, climbing, trekking, wildlife observation. Within its boundaries lies the Laguna del Laja, the country's largest natural dam and which was formed thousands of years ago by the eruption of the neighboring Volcan Antuco, another attraction of the park. The Antuco Volcano dates back some 10,000 years, being one of the best known in Chile. On the foothills of this volcano is located the Memorial with the names of the 45 Chilean Army conscripts died as a result of a snowstorm in May 2005, during a military exercise. Close by is situated the Sierra Velluda stratovolcano, a lesser known name but even more imposing than Volcan Antuco, this mountain has two main summits, whose 3,585 meters northern peak is the highest mountain in the region. Another attraction of this National Park is the Rio Laja, which is born in the homonymous lake and after traveling 148 kilometers westward gives rise to the famous Salto del Rio Laja. In the vicinity of Laguna del Laja National Park, 25 km. East of Antuco are also located El Velo de la Novia and Salto Trubunleo, lovely cascades of considerable height that form a gentle mist, at a distance of about 100 mts. from each other. It is the capital of the Province of Ñuble, Region of Bio Bio, founded on June 26, 1580 under the name of San Bartolome. Despite not being the center of the public activity of the time, Chillan is associated strongly with the Independence of Chile for being the birthplace of the Chilean Liberator Bernardo O'Higgins Riquelme born here in 1778. Its population according to the 2012 census was of 175,869 inhabitants. The city has been affected throughout its history by large earthquakes from that recorded in 1751 which is estimated of 8.8 degrees of the current Richter scale to the most recent of the same magnitude registered in 2010. The most representative postcard of the city is the Cathedral, with an unusual oval shape. A several meters high cross is located next to remember the victims of an earthquake. The Cathedral is situated next to the Plaza de Armas (Main Square), reference point the city. Beautiful and well maintained square with ancient trees, a good place to relax or have fun. In the center is located the monument to Bernardo O'Higgins. A picturesque place and tourist attraction of the city is the "Mercado de Chillan", market place with a wide variety of craft stalls and delicious food, the most offering the typical product of the city, the Longaniza de Chillan (Chillan's pork sausage) varied and of excellent quality. 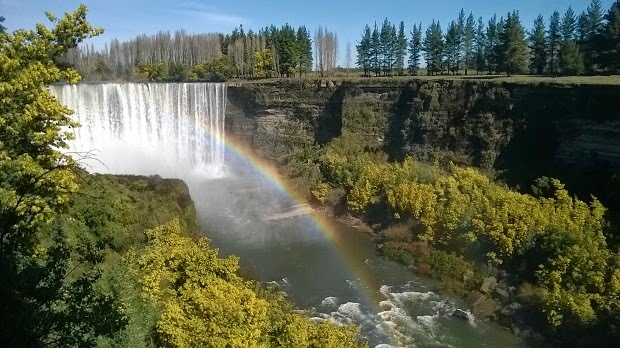 Chillan is renowned also for its proximity to the Termas de Chillan and its ski resorts, tourist complex known today as "Nevados de Chillan", one of the most important in Chile and South America, another of the preferred destinations of foreign tourists. Located 175 km. of the city of Los Angeles. It is a small lake, 200 hectares of surface in a very little polluted area of the Andes Mountains, with a nice place for camping amidst forests and mountains. There are nearby roads to walk and go around Laguna la Mula and Callaqui Volcano at Reserva Nacional Ralco. Its name "El Barco" (The Boat), comes from the formation in the middle of the mass of water that seen from the height gives the impression of being a small boat on the lake. Adventurers who reach these remote place will be rewarded by the transparent waters of the lake, the abundance of fish and a landscape so pristine that thrills. Ñuble National Reserve is one of the most biodiverse Protected Wild Areas in the country, located between the Chillan Volcano and Laguna del Laja, 95 kilometers West of Chillan, capital of the province of Ñuble. The Reserve especially protects the Huemul, a type of deer native of Chile and Argentina, the fauna also includes Pumas, Viscachas, Condors, Black Carpenters, Black- Necked Swans, etc. The vegetation is formed by the shrub known as Radal Enano, Hazel Trees, Coigües, Lleuques and Cypress of the Mountain Range. The Reserve has several extensive trails, picnic and camping areas, lookouts, horse rentals and thermal waters. To get there you must go from Chillan to the town of Los Lleuques on the way to the Termas de Chillan. Just before reaching it, there is a detour to the right leading to the Reserve and the Thermal Waters of Diguillin. From the detour, there are 25 more kilometers to the entrance of a private farm and then, through a road suitable only for 4 x 4 vehicles, the last 8 kilometers to the entrance of the Reserva Nacional Ñuble.